Washington DC, October 29, 2007 - The National Security Archive filed a motion on Friday, October 26, seeking expedited discovery against the Executive Office of the President to find out what e-mails are missing from the White House e-mail system or backup tapes. Also on Friday, a similar motion was filed in a virtually identical lawsuit brought by Citizens for Responsibility and Ethics in Washington (CREW) on September 25, 2007. The Archive filed this case on September 5, 2007, against the Executive Office of the President (EOP) and its components seeking to recover at least 5 million federal e-mail records improperly deleted by the EOP. 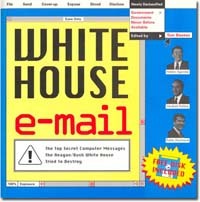 After the government failed to provide adequate assurances that backups and copies of the missing e-mail would be preserved throughout this litigation, on October 11, 2007, CREW filed a motion for a temporary restraining order against the White House defendants in its case. A hearing in CREW’s case was held before Magistrate Judge Facciola on October 17, 2007. Magistrate Judge Facciola issued a Report and Recommendation on October 19, 2007, advising the Court to grant a temporary restraining order. The government has filed objections to Magistrate Judge Facciola’s Report and Recommendation, and CREW has responded to the government’s objections. Documents in National Security Archive v. Executive Office of the President, et al. Documents in Citizens for Responsibility and Ethics in Washington (CREW) v. Executive Office of the President, et al.